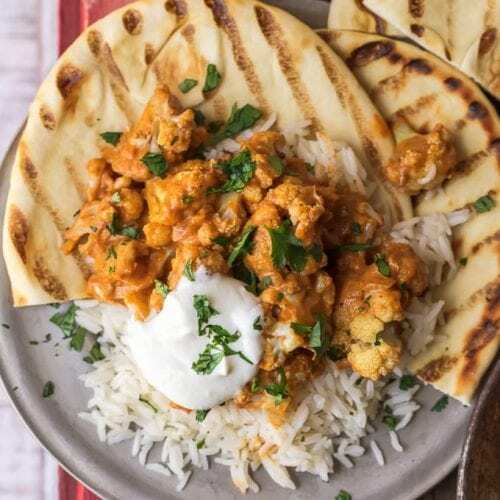 This Vegetarian Tikka Masala is made with Cauliflower instead of chicken! This delicious Indian cauliflower recipe is perfect for vegetarians, but it's also great for usual meat-eaters. The texture of the cauliflower masala (or Gobi Masala) is perfect, and the flavor of the homemade tikka masala sauce is absolutely delicious! Serve it on basmati rice with naan to complete the dish. Heat oven to 450°F and line a baking sheet with aluminum foil. Lightly spray the foil with nonstick cooking spray. In a large mixing bowl, combine all ingredients and toss to combine. Pour the seasoned cauliflower onto the prepared baking sheet and place on the center rack of the oven. Roast 10-12 minutes or until cauliflower is golden and just tender. Transfer cauliflower to a cooling rack until ready to use. Heat a large skillet over medium heat and add the butter and olive oil. When the oil shimmers, add the minced onions and cook until translucent. Add the minced garlic and cook 30 seconds, stirring often. Add cumin, salt, ginger, cinnamon, turmeric, Garam Masala and paprika and cook 1 minute, stirring often. Add tomato sauce, reduce heat to low and allow sauce to thicken 5-7 minutes, stirring often. Add cream and sugar and bring sauce to a low boil. Cook another 8-10 minutes, over low heat, until sauce has thickened a bit. Add the roasted cauliflower to the sauce, mix well and serve. Cook according to package directions. Keep warm until ready to serve. Spoon basmati rice down the center of a serving plate/platter and top with Roasted Cauliflower Tikka Masala. Serve with naan, a side of sour cream or Greek yogurt and garnish with chopped fresh parsley or cilantro and a lemon wedge.